I still find it strange that the meticulous and careful Japanese could have sold these filters. There must have been evidence of failures. Also, it was probably intended only to be used with a Huygenian eyepiece having simple elements and with the focal plane rather far from the filter. Why were these filters designed to fit at the eyepiece? Wouldn't it have been just as easy to fit them over the objective? Was it purely economic, a smaller filter being cheaper than a larger one? And yes, light passes through the crack. 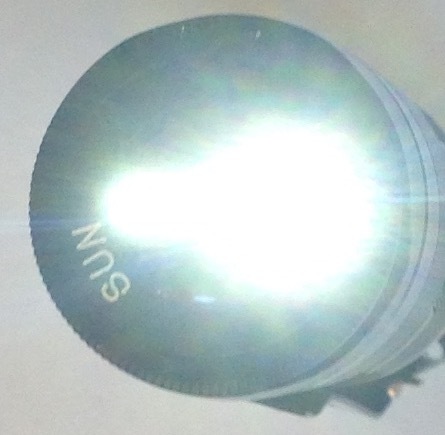 I've added a third picture with the filter on a flashlight. Hopefully nobody was looking through this at the time. Edited by nashvillebill, 04 July 2018 - 10:20 AM. I think it's strange how (for some cosmic reason), my last few telescope purchases have included the Sun filter but no Moon filter. The Moon filters must end up in Black Holes. The latest one came without any eyepieces but there was that darn filter again! Perhaps the explanation is, they don't get used so tend to stay in the box. I can't believe they sell these brand new from China. Read the description for warnings. 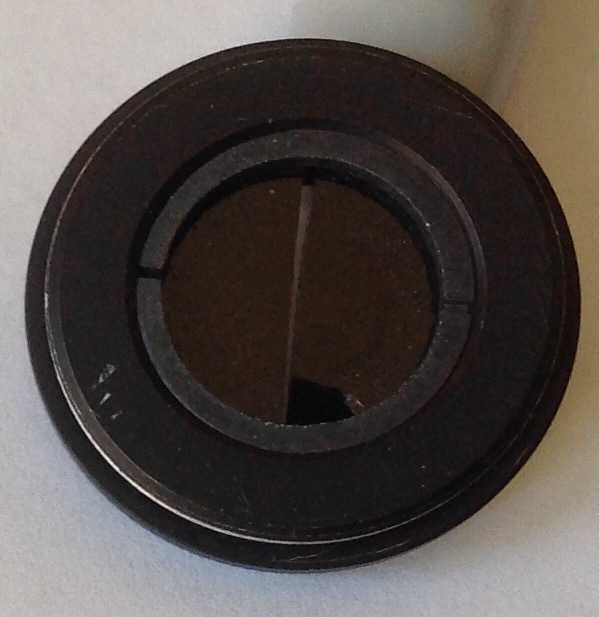 Also available for 1.25" eyepieces! It will explode but it won’t hurt your eyes because its under the eyepiece?! I’m so glad to see that they provided detailed usage instructions! I feel so much safer. They might have added, “Viewing sun much safer between sunset and sunrise”. I could lose my vision for only $2.50 plus shipping? What a bargain. 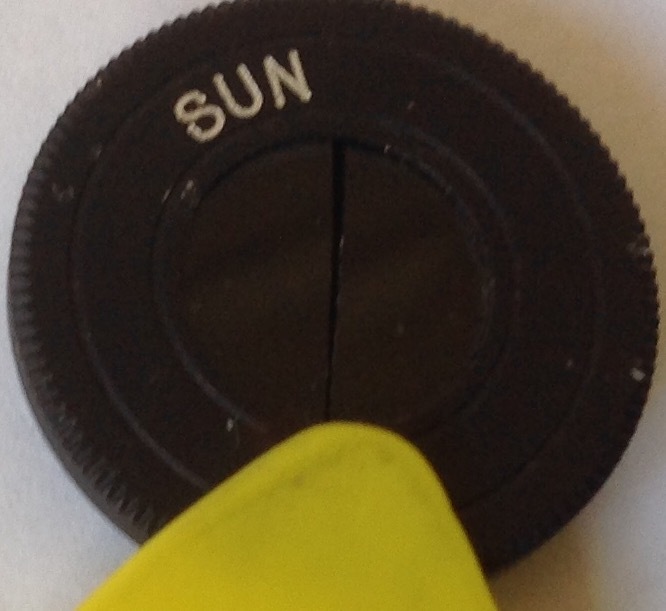 Indeed, the best advice is simply never to use the eyepiece-based "Sun" filters ... never! That quick look is not worth the crack, the blinding flash, and then the permanent eye damage. I liked one poster's conception of the "Sun marshall," too. Indeed, an aperture solar screen can be blown/hit/fall/etc. off. I use Velcro to be sure. Also, when others are around, you must watch them like hawks! I've had youngsters try to remove the cap on the finder! Here's another problem with solar viewing some of you may not have thought of. In lieu of a full aperture filter (i.e., Tuthill, Thousand Oaks, etc. ), some of us have projected the Sun through an eyepiece. If you do this, make sure the eyepiece is uncoated and not cemented. Otherwise, the heat will damage the coatings and/or cement, and ruin that potentially expensive eyepiece. The best choices for a projection eyepiece are uncoated two-element designs, such as Huygens, Ramsden, or symmetrical types. They are surprisingly hard to find these days. I can remenber the older times, when there were many telescopes sold with 0.965 inch equipment, especially with those very dangerous sun filters! Of course it was told to reduce the the telescope's aperture down to 2 inches - but who followed this advice? So, I ordered a star diagonal and three colour filters for my two vintage telescopes, optimized only for 0.965 inch equipment. The new equipment will be delivered until mid of November. When it will arrive, I'll write a little report about these additional equpitment for my scopes here. Edited by Uranotopia, 28 October 2018 - 04:01 PM. I still find it strange that the meticulous and careful Japanese could have sold these filters. If they assumed others would be careful and meticulous in their use of said filters, perhaps not so surprising. They may well have thought that it would be rather obvious to anyone that using those filters in the eyepiece of a telescope in other than the prescribed manner could or would have extremely deleterious effects upon the eye. And don't forget, that the tekescope's tube will become warm or hot! There's similar recommend as if you use the solar projection method: only safe with achromatic doublet refractors and without plastic or clued eyepieces! Some years ago I'd ruined a cheap 'plastic style' star diagonal and simple eyepiece with solar projection with 80/400 doublet achromatic. You don't as they are not designed for Newts. They are really designed for refractors and maybe for Cats but I never liked the idea of the full aperture of the Cat falling on the smaller secondary either. Best thing for a Cat or Newt is a solar filter on the front of the tube. If a truss Dob don't do it without a light shield around the truss. I personally prefer a wedge on a refractor over a solar filter over the objective as I think the view is sharper. I have used a Herschel wedge since the late 60's when I bought my first one from Optica b/c. Still have it but also have a Lunt now, too. My SV102ABV OK4 doublet is my current designated solar scope with both wedges and front filters plus a 40mm Coronado with adapter on the front and a BF10 diagonal at the back for Ha.